I ran into a friend recently, who owns a frame shop in Bar Harbor. She said, “Remember those earrings I got from you at the craft fair, a long time ago, with the beach stones? Well, I’ve lost one and I wonder if you could make me one to match it?” I remembered that we had traded her framing services for my earrings, but I couldn’t recall the exact pair. “Why don’t you send it to me and I’ll see what I can do,” I told her. I had forgotten making these, back in 1998, when PMC (Precious Metal Clay) was still pretty new, and only available in its original form. This earring represents my first attempts to set a stone in place, allowing for the shrinkage of the clay, and my first attempt at creating and embedding a fine silver wire to hang the earring. I knew nothing of trying to pre-finish an unfired piece with an emery board or sanding pads. I relied on clean cuts and smoothing the clay with my wet fingertips. (A practice I need to use again, more often.) 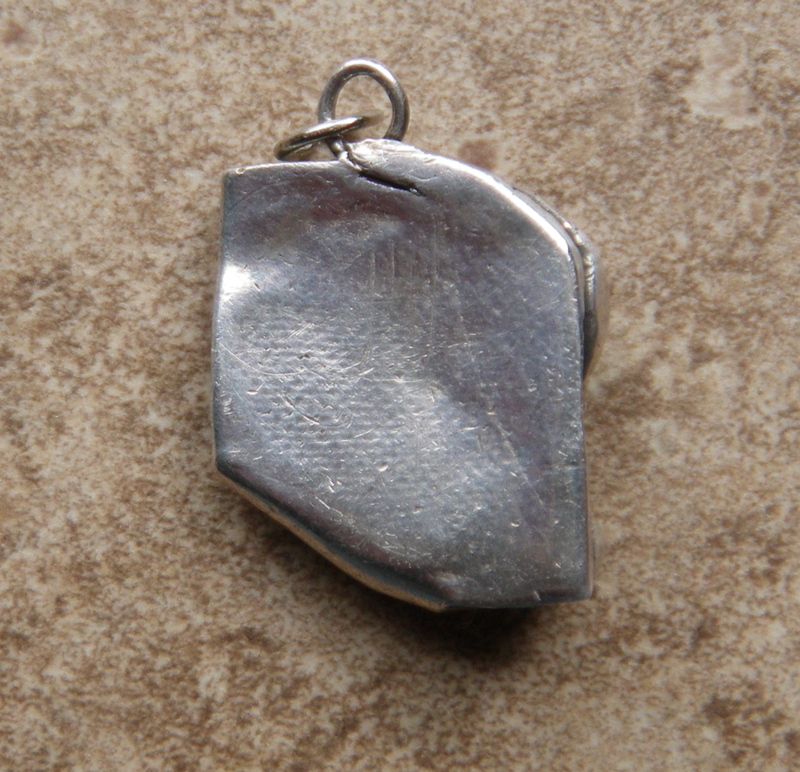 The high polish came from a muslin buffing wheel and rouge compound, after the piece had been fired. The world of PMC has changed a lot in the past 12 years and so have my methods for working with it. It would be too time consuming to try for a mirror image of this particular earring. I sent the earring back to my friend with a note explaining I had photographed the piece and would make a new pair of earrings, with a similar look. Then I would bring them by her shop to see if she liked them. 12 years ago I did not have a digital camera, and I did not work from sketches when it came to experimenting with this new form of silver. K’s lost earring provided me with an opportunity to look back at something I had forgotten, and to see current influences from some of my earliest work in metal clay. I fired the stone in place. I remember loosely folding the clay over. There was so much shrinkage then with the original PMC, I was just making a lucky guess. 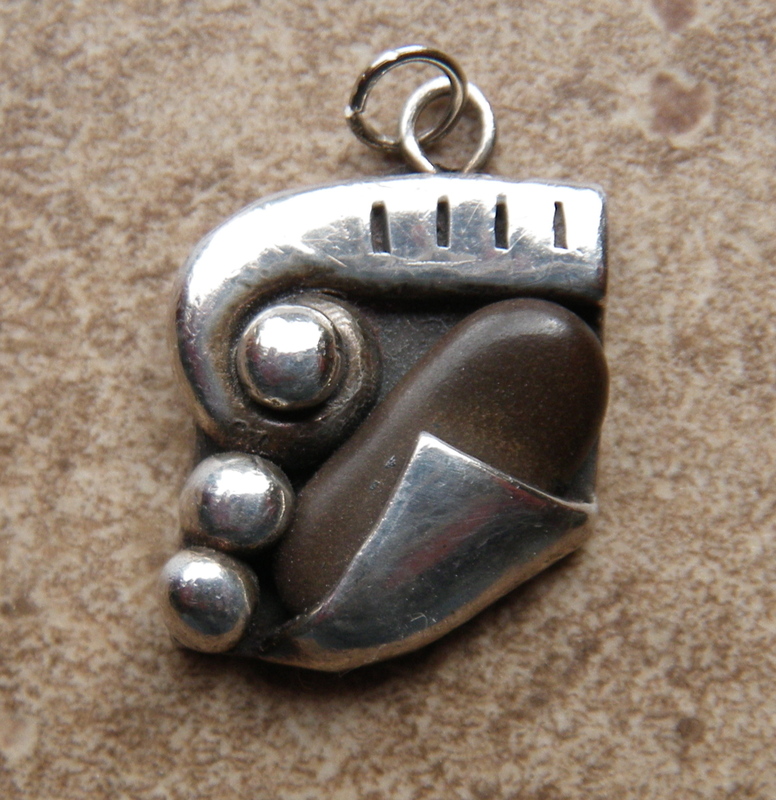 Some of the other earrings in that series shrunk away from the stone in a convex way, popping the stone out of the fired piece. All of the beach rocks I fired changed color. Most of the nice grays turned to brown. Happy Mother’s Day to you tomorrow!